Lin is one of seven different playhouses in the LEDON Explore series. In addition to two benches and a table, Lin also has a splash table, which can be used by several children at the same time. Playing with sand and water stimulates the sense of touch, fine motor skills and creativity. Fine motor skills are important for hand development and grip patterns, which in turn are important for learning to write. 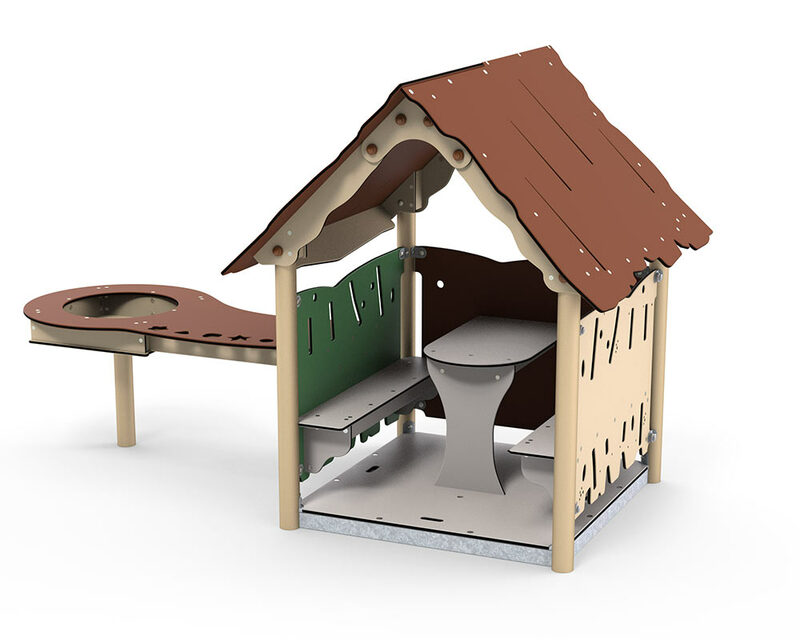 The playhouse’s floors are designed with a specially developed non-slip cubit-grain surface, and so the playhouse does not require a safety surface, and can therefore stand on grass. The entire LEDON Explore series has been designed in cooperation with children to ensure the highest possible play value. Moreover, none of the playground equipment requires special maintenance, while the natural colours ensure a realistic playground. The entire Explore series is designed and manufactured at our production facilities in Denmark. This ensures short delivery times as well as easy access to assistance and advice. If you would like to read more about LEDON Explore, you will find much more in our new Explore catalogue. Designed in cooperation with children to ensure the highest possible play value. Developed using materials that require low maintenance and with natural colours. We prepare design proposals so you can see what your new playground might look like. The entire Explore series is approved by TÜV SÜD in accordance with the latest standard EN 1176.